Still have more questions? Feel free to give us a call and we will be happy to answer them. How can I find my system and its components? What are common causes of septic tank failure? What preventative measures can help my system work properly? What should I do if my system backs up? Alternative systems use pumps or gravity to help septic tank effluent trickle through sand, organic matter (e.g., peat, sawdust), constructed wetlands, or other media to remove or neutralize pollutants like disease-causing pathogens, nitrogen, phosphorus, and other contaminants. Some alternative systems are designed to evaporate wastewater or disinfect it before it is discharged to the soil or surface waters. 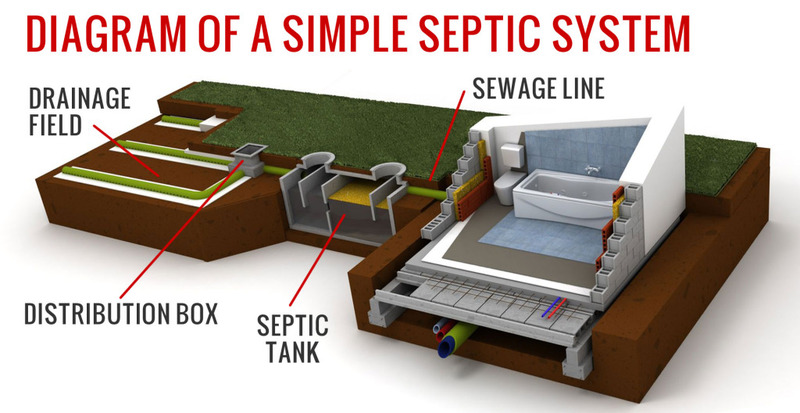 Most septic system failures are related to inappropriate design and poor maintenance. Some soil-based systems (with a leach or drain field) have been installed at sites with inadequate or inappropriate soils, excessive slopes or high ground water tables. These conditions can cause hydraulic failures and water resource contamination. Failure to perform routine maintenance, such as pumping the septic tank at least every 2 to 3 years, can cause solids in the tank to migrate into the drain field and clog the system. Sometimes you want to have your septic system pumped out or you are required to locate your system before you can extend your deck or add on to your house, and you may not know exactly where your septic system is. Checking with the local health department for an asbuilt drawing of your system is the first step. If no records can be obtained A-1 Pumping & Excavating can locate your tank with a steel probe. In some cases an electronic locator is the most effective way to find the tank. Each pumper technician carries a locator on his truck. A-1 Pumping & Excavating uses an electronic locator and a locator snake to find the tank, distribution boxes and trenches. We mark components with stakes or marking paint and can fax a system sketch directly to the town hail if needed. A-1 Pumping & Excavating also keeps records on file for future use. The answer is “it depends.” A tank should be pumped and inspected every 2 years (more often if you have a garbage disposal), but frequency of cleaning depends on the size of the tank and the use it is given. At an average use rate of 70 gallons per person, a family of five uses 127,750 gallons of water a year! If the number of people in the house exceeds the average for that size dwelling (five people for a three bedroom house, for example) - or if the septic tank is smaller than state regulations now require - the system should be pumped every year until experience indicates a longer period can be allowed. If the solids which settle to the bottom of the tank are not broken down by bacterial action and build up to a high level, they can be carried from the box into the leaching system, clogging the pipes and the field. Eventually the remaining undigested material accumulates and must be cleaned out. This material is called “sludge” or “septage”. Sludge accumulation is approximately 80 gallons per capita per year or 320 gallons per year, per family of four. over use - volume of water discharged exceeds system capabilities. The signs of failure include high surface water in the leaching area, lush growth of grass, odor and waste water draining slowly from the lowest fixtures...or even backing up. A little attention to the care of your system can help avoid the nightmare of a failing system. Assuming that your septic system was properly located, designed, and installed according to stage codes, you are in the driver’s seat for the care of your system. By following the recommendations below, you can help your system work properly for years to come. Conserve water to reduce the amount of wastewater that must be treated & disposed of by your system. Doing laundry over several days will put less stress on your system. Repair dripping faucets and leaking toilets, avoid long showers and use water-saving features in faucets, showerheads and toilets. Divert down spouts and other surface water away from your tank and drain field. Excessive water keeps the soil from adequately cleansing the wastewater. Learn the location of your septic system and drainfield. Keep a sketch off it handy for service visits. If your system has a flow diversion valve, learn its location and turn it once a year. Flow diverters can add many years to the life of your system. Keep your septic tank cover accessible for inspections and pumping’s. Install risers with lids, if necessary. Have your septic tank inspected and pumped regularly by a licensed septic tank contractor. Suggested frequency is 2-3 years. Pumping your septic tank is probably the single most important thing you can do to protect your system. If the buildup of solids in the tank becomes too high and solids move to the drain field, this could clog and strain the system to the point where a new drain field will be needed. Ask about our maintenance plans. Call your county health department or a registered septic tank contractor whenever you experience problems with your system, or there are any signs of system failure. Keep a detailed record of repairs, pumping’s, inspections, and other maintenance activities. Pass these on to the next homeowner. Don’t drive over your tank & drain field or compact the soil in any way. Don’t dig around the tank or drain field, or build anything over it, and don’t cover it with a hard surface such as concrete or asphalt. Don’t plant anything over or near the drain field except grass. Roots from nearby trees & shrubs may clog and damage the drain lines. Don’t use a garbage disposal, or at least limit it’s usage. Disposals increase solids loading to your tank by 50%, so you have to pump your tank more often than normally suggested. Don’t use your toilet as a trash can or poison your system and the groundwater by pouring harmful chemicals and cleansers down the drain. Harsh chemicals can kill the bacteria that help purify our wastewater. Examples: coffee grounds, disposable diapers, sanitary napkins, cigarette butts, fats, grease or oil, paints, thinners, photographic solutions, antibiotics, dental floss, kitty litter, paper towels, varnishes, waste oils and pesticides. Never enter a septic tank — toxic gases from the tank can kill. If your system develops problems, get advice from your country health department or a licenses septic tank contractor. If sewage from your plumbing fixtures or onsite system backs up into your home or business, avoid contact with the sewage and the possibly harmful pathogens it might contain. Contact A-1 Pumping & Excavating by calling 605-334-4440 or your local health department or regulatory agency immediately. Cleanup personnel should wear protective clothing (e.g., long rubber gloves, face splash shields). After cleanup is complete, all equipment, tools, and clothing used in the cleanup and the flooded basement area should be washed thoroughly and disinfected with a mixture of 90 percent water and 10 percent household bleach. The area should be dried out with fans, heat lamps, or other devices and not be used until it has been completely dry for at least 24 hours. Remember: Whenever the water table is high or your sewage system is threatened by flooding there is a risk that sewage will back up into your home. The only way to prevent this backup is to relieve pressure on the system by using it less. You should also check your maintenance record and consider scheduling your next pumping service.